All bars/breweries must be easily accessible through public transportation or short walks. No 20 minute walks, no unnecessary bus connections and definitely no taxis. That's cheating, folks. Any bar/brewery can be included, as long it offers great beer. The more the merrier. Enjoy! Experience a 'hood you wouldn't normally venture to while sampling the beer that's helping to make this city so flippin' special. There are very few streets in Chicago with Halsted's combination of history and diversity. Spanning 168 city blocks, the street daggers through over a dozen neighbourhoods, passes near two Major League Baseball stadiums, offers stunning views of the downtown skyline, and is the location of countless historic landmarks. We began our Sunday afternoon tour at one of the city's recently refreshed watering holes, Maria's Packaged Goods & Community Bar (31st & Morgan) in Bridgeport. If you're like us and hadn't made the trip to this south side establishment yet, the draw of the place might be a little difficult to explain. With a somewhat unassuming storefront exterior, it's an easy place to miss. Peek inside, however, and you'll start to see what all the fuss is about. A tiny front room is crammed from floor to ceiling with craft beer. Well-known local brews sit side by side with hard-to-find offerings from Chicago and beyond. Maria's Packaged Goods is 1 part (really good) beer store & 1 part (even better) bar. Well hidden behind the back wall of the Bottle Room is Maria's bar. We were the first ones to pull up at the bar that day and were quickly greeted by the bartender, Jen – who was more than happy to talk shop with us. Maria's offers eighteen draughts, many of which were completely new to us. Jen was gracious enough to offer us several samples of whatever caught our eye and even opened a bottle of Maria's own Ginger Beer for us to share (bottled by nearby Chicago staple Filbert's Root Beer). Other customers trickled in throughout our stay, but the small shop feel and friendly atmosphere never waned. Again, hard to say exactly why, but Maria's provided the perfect anchor for our Halsted Craft Crawl. You could spend all afternoon at Maria's but the CCC had us needing to venture onward. A quick 5-minute walk east gets you back to Halsted and the #8 bus. On a typical weekend, the bus comes by about every 15 minutes so be sure to plan your bathroom stops. We hopped on the bus and headed north for ten minutes into historic Pilsen. Between Cermak and 21st are two bars that come highly recommended. Skylark and Nightwood both boast impressive beer menus in addition to fantastic food. Unfortunately for us on Sundays, Skylark doesn't open until 4pm and Nightwood was hosting a wedding reception. That'll teach us to ignore the first rule of the CCC. A letdown for us this time around, but let us know about your experiences at these haunts and we'll be sure to head back again. Just a few Pilsen favourites, all within a quick walk up Halsted, after you hop off the #8. Pilsen doesn't shy away from it's cultural influences. Following that misstep, we were determined to check out at least one of Pilsen's many great watering holes. A short walk up Halsted gets you to 18th Street and the heart of Pilsen. A few blocks to the west, you'll find Simone's (18th & Morgan), a neighbourhood bar and grill who's interior looks like it was pieced together from leftover parts of Chicago's past. We mean that in the best way possible because the front room of Simone's is about as unique as it gets. Sitting at the bar, you'll see elements of arcade games, pinball machines, and bowling alleys. The building itself is fascinating but we were here for the beer and, while not as extensive as some of our other stops, didn't disappoint. No matter your beer preference, you're sure to find something you like from a selection that touches all the bases. Also of note is the fantastic Dia De Los Tamales, located half a block down from Simone's on 18th. We took the chance to stop in for some lunch and were not disappointed. Looking for a respite from the CCC before heading on? Try the Spicy Black Bean & Corn tamale and their hottest sauce, if you dare. A little jaunt up from Pilsen lands you in Greektown & West Loop area with no shortage of great watering holes. Jaks'll wet your palette, but anyone who's visited the West Loop knows that the beer scene revolves around one place. Haymarket Pub & Brewery is the brainchild of Pete Crowley, the award winning brewmaster who spent ten years learning his trade at Rock Bottom. After venturing out to start his own brewery back in 2010, Crowley and co. have established themselves as one of the premier beer destinations in the city. The location (Halsted & Randolph) doesn't disappoint either, with it's spacious layout and beautiful brewery visible through tall glass windows in the dining room. As it had been a while since our last visit, we took the chance try small samples of their ever-rotating brews. To put it simply, if you can't find at least one beer that you like at Haymarket, you're probably reading the wrong menu. Despite the tribal tatt logo, this is a great cozy haunt. With even better beer. Greektown's Jaks Tap, West Loop's Haymarket & River West's Paramount Room all share the same thoughts on signage. Our Sunday evening was winding down fast, and there was one neighbourhood place left that we always have to hit. A quick trip north on the #8 bus takes you to Paramount Room, located on Milwaukee one block east of Halsted. The place is incredibly intimate with a usually subdued atmosphere making it the perfect place to finish up this iteration of the CCC. Do yourself a favor and grab one of the two tables by the window where you can sit back, enjoy a tasty pint on tap and wind down after a "tough" day of bar crawling. By this time, we were peckish again and ordered a couple sensational appetizers to really cap off the day. Get the fried green beans. Seriously. Even if you're not Craft Crawling, Paramount Room is an excellent after work option and offers quick access to the Green and Blue Lines when heading home. So that wraps up our second Chicago Craft Crawl, on the #8 Halsted bus. For us living on the north side, this gave us the perfect opportunity to check out a few 'hoods we don't spend nearly enough time in, and revisit a few old standbys. So, did we miss one of your local haunts? Should have we have continued further north to a place like Burger Bar or slowed down a little and stopped into Au Cheval or The Beer Bistro? 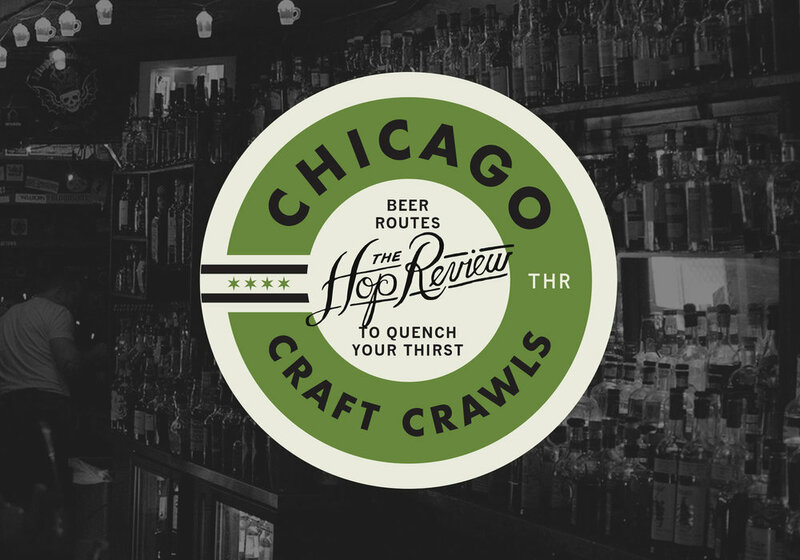 Let us know what you think – or, better yet, get out there and try the Chicago Craft Crawl for yourself. It's this wealth of options that make Chicago the best place in the world for a beer lover like you. Cheers!